For once I baked a Sweet Melissa Sundays recipe ahead. And thank goodness because the heat has been sweltering this week. My oven is officially on hiatus. *The taste didn't wow me. They weren't chocolaty enough. I did make a sub on the chocolate using 70% dark instead of unsweetened (my fault, I misread the recipe). I tried to make up for it by adding some unsweetened cocoa powder but it didn't do the trick. *2 sticks of butter might have been overkill. I almost felt like I could taste the butter in the finished product when I wanted to be tasting more chocolate. I added chocolate ganache to half the brownies to pump them up. But it still didn't move these any closer to the "wow" category. The quest for the perfect brownie continues. I was checking out Tracey's Culinary Adventures and I want to try Dorie Greenspan's recicpe. This one looks like my kind of brownie. Thanks to Tiffany at A Spoonful of Laughter and a Heap of Love for choosing this week's recipe. See the tasty creations of other SMS Bakers here. Love the photos. The tic-tac-toe photo is so cool!! Have you heard of a cookbook called BAKED by Matt Lewis and Renato Poliafito? They have a brownie recipe that is really good. It is a fudgy type brownie (if you like fudgy). I went to their bakery in Red Hook, Brooklyn, NY and tried their Sweet and Salty Brownie, which has a caramel filling. OMG! Here’s a photo of the brownie. I’ll be posting the recipe in August with a tutorial. Your brownies look delicious! Love that you added ganache and powdered sugar. Sorry you didn't care for them much, though. I recently reaffirmed that I don't like brownies with a ton of butter which is one reason I sat out this week. I used 60% chocolate for mine. I'm English so I'm a little unsure what unsweetened chocolate even is. Haha! I'm always making substitutions. Your photo is "WOW!" even if you didn't think the final product was. Love your checkerboard photo!!! These didn't wow me. Not chocolatey enough for me, either!!! The chocolate ganache looks gorgeous and shiny! Sorry these brownies did not wow you with a chocolaty flavor and the quest continues. One day the right brownie recipe will hit and the wait will have been worth it =). I love these cupcakes and they are easy to make. Just little steps put together to make a full package =). The brownies look so pretty! I agree that this was a nice amount of brownies, no need to worry about leftovers. I added two ounces of 71% chocolate to mine. I had compared this to a couple other recipes I like and the chocolate content just seemed way too low. Good luck in your search for brownie perfection. 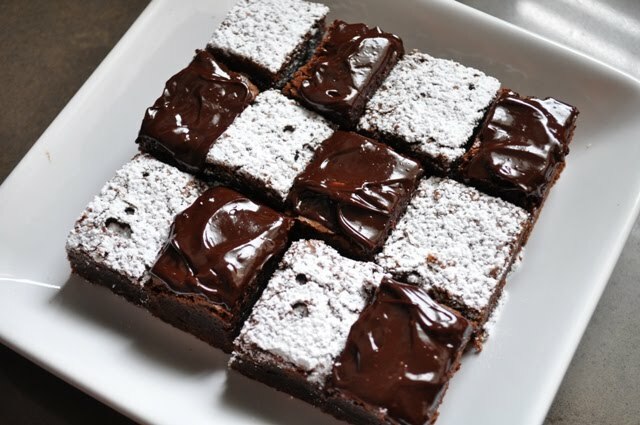 Your brownies look amazing! I love the checkerboard effect you have in your last picture! Love how you decorated your brownies. They look amazing. Wow, love the decoration!!! Very creative. Too bad you weren't wowed by them. Speaking of fav brownies: my fav are hands down Nick Malgieri's Supernatural Brownies (they were featured on NYT a couple years back). 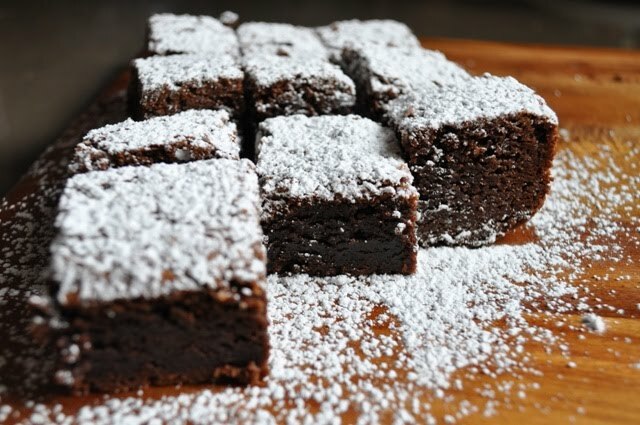 I found the recipe for you here: http://www.cookstr.com/recipes/supernatural-brownies. I won a couple blue ribbons when I entered them at the State Fair. Let me know if you try them. Would love to hear how you like them. i love the checkerboard brownies...what a great idea! Oh man! Those look awesome! Love the powdered sugar and the chocolate icing!! YUMM! Love the pictures! My friends all love chocolate so whatever I make with chocolate - it's a big hit! Well I'm super late to comment, but your brownies look awesome! 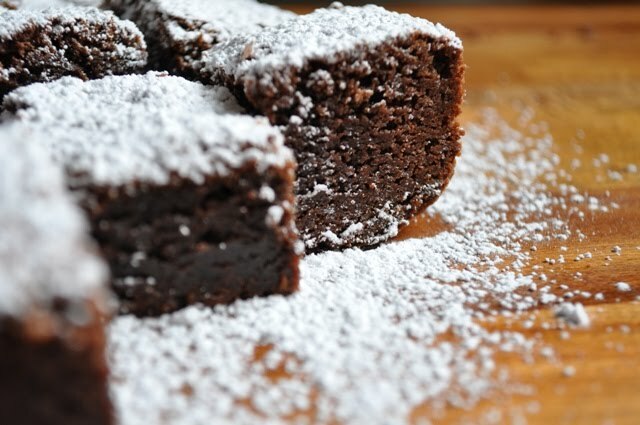 I love the photo of the alternating powdered sugar topped and ganache topped brownies.